Two new "blue books" help enthusiasts track prices for white-whale whiskeys on the secondary market, raising questions about the true value of rare bottles. One of the first things I do every morning is check the markets. E.H. Taylor “Tornado” is up 23% since October. Michter’s 25 now goes for a cool $1,000. Four Roses Mariage is being moved for some seven times retail cost. If those don’t sound like stocks, it’s because they’re not. And though these prices I’m referencing come out of a Kelley Blue Book, I’m not talking about used jalopies either. Allow me introduce you to the wild world of secondary-market whiskey selling, and the online “blue books” that now attempt to monitor such rapid price changes. Within the past year, two pricing guides have emerged to track the secondary market for highly coveted whiskeys. Bourbon Blue Book is the more bare-bones option, while Bottle Blue Book additionally monitors month-to-month growth trends. Both are now helping whiskey geeks make more informed decisions about their black-market buying and selling. When I first started poking around these sites, I was concerned the proprietors might be like the rare-beers mules I wrote about recently: scared to tell me their names or give me any personal info lest I expose their questionably-legal place in the black-market ether. But they weren’t at all. Bourbon Blue Book is the work of John Bull, a VP of sales and marketing for a manufacturing company out of northwest Arkansas. Bottle Blue Book was started in September of 2014 by Justin Sloan and Dan Donoghue, two Lexington, KY firearms dealers by day and bourbon enthusiasts by night (“Somehow we need to work with tobacco to hit the trifecta,” jokes Donoghue). All these men have somewhat similar backstories as rare-whiskey collectors. Sloan is a co-founding member of The Bourbon Mafia, a national group of bourbon aficionados, and also runs a website where users can find information on Maker’s Mark special-edition bottlings. Likewise, Bull once started a Facebook group called Bourbon Exchange (BX) to focus on the selling and trading of rare bottles—something sorely lacking at the time. It was 2012 and eBay had just outlawed the sales of collectible bottles with “inconsequential contents” (an inside joke among buyers and sellers who claimed the bottles were collectible); meanwhile Craigslist has always been a total crapshoot for illicit alcohol selling. Quickly, BX bloomed to more than 3,000 members and became difficult for Bull to manage. Every day the page’s wall would fill with people asking for pricing information on rare bottles, and Bull himself was constantly dealing with a barrage of emails asking for his personal valuations. “Because I was the group admin, people naturally assumed I was the authority on values,” Bull told me. “The truth is, unless I had bought or sold one recently, I had no idea.” He realized that, unlike used cars or homes, there was really no resource that enthusiasts could use to get a ballpark estimate of what a bottle was actually “worth,” especially in such a rapidly changing environment. Thus, the Bourbon Blue Book was born. At the beginning of Bourbon Blue Book, users simply emailed Bull the pricing data for their recent black-market bourbon transactions and then received a private password so they could then benefit from everyone else’s self-reported data. Bull created the spreadsheet and manually dropped in people’s submissions every two to three weeks to get pricing averages for each bottle. Once the site was well-established, he removed the password so others could benefit from the information. Bottle Blue Book began as a slightly more automated resource. Noticing that there wasn’t a good resource for finding real-time values for those rare bottles they owned (or wanted to own), Sloan and Donoghue began collecting pricing data on bottles early last year. Their data is also 100% anonymously self-reported and, so long as a reported price doesn’t stray too drastically from the current norm, it gets verified and added into the system. Still, with the secondary bourbon market being the wild west right now, it’s hard to completely nail prices. “We have only been collecting data for a few months and are already witnessing tremendous fluctuations between bottles,” says Donoghue. One example he cites is the recent bottling of William Larue Weller, which first appeared in the blue book at $250 and is now selling for around $400. On the other hand, Parker’s Heritage 13 Year Wheat Whiskey started off around $225, but now goes for about $150. Spot-checking certain bottle prices between the two blue book sites, I find their prices are quite similar (e.g., the red-hot High West Bourye—retail $60—lists for $165 on Bottle Blue Book and $145 on Bourbon Blue Book). But are these prices “accurate”? Donoghue feels he still needs more information, especially for certain bottles. It’s also become a good starting point for some serious profiteering. As you probably figured out by now, these prices don’t just exist in theory. In fact, they are now often cited as gospel for whiskey sellers and traders who use private Facebook groups similar to BX to set up deals (Whiskey Exchange and Strong Water Trading are two of the most prominent). Most users of these sites are simply bourbon fans, looking to acquire bottles they don’t have while perhaps helping others acquire bottles they need. But there’s plenty of money to be made if that’s your racket. 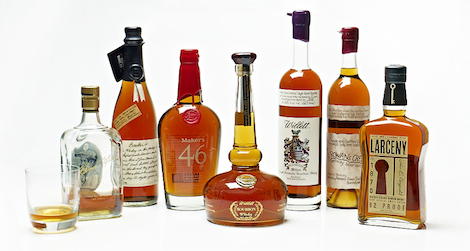 Just a few months ago, I saw a seller successfully move $35,000 worth of rare bourbon. And it’s a well-known fact that bottles from the Buffalo Trace Antique Collection (i.e., the aforementioned William Larue Weller, George T. Stagg, Thomas H. Handy Sazerac, etc.) hit the retail shelves at $80 and, if you’re lucky enough to score some, can immediately be flipped for $200-$400. 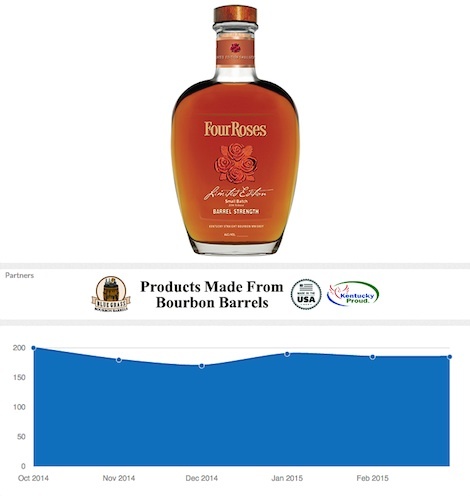 In an interesting post from last December, the Bourbonr Blog analyzed this practice as well, noting anecdotally that Old Forester Birthday Bourbon’s retail price had gone from $45 to $65 in just one year—something the Bottle Blue Book confirms. However they’re used by consumers, these blue books are 100% legal and, in my opinion, of great service to both bourbon fans and the industry itself. Price guides didn’t create the black market—the great American thirst for obscure and expensive bourbons did. And information, if anything, actually helps make sure things remain more fair between collectors. We asked the founders of the Bottle Blue Book and Bourbon Blue Book to tell us the whiskies that they think are worth tracking, due to their potential to soar in value. Aaron Goldfarb (@aarongoldfarb) is the author of The Guide for a Single Manand The Guide for a Single Woman.